Country music hasn’t been a part of my life since high school. Well, and that Tim McGraw concert in college. To be blunt, I fell in love with a black guy, and country stations weren’t exactly programed on his radio dock. However, sometimes, in those rare moments I find myself alone in the car, I stop and listen to a song or two. I’ll embrace the nostalgia. It takes me back to that silver Dodge Avenger and the loops I drove around Ames blaring “Wide Open Spaces“. I also picture my dad. If it weren’t sports radio, country was his tune of choice. The summer after my freshman year in college, he and I drove down to Louisiana. We had Garth Brooks’ greatest hit CDs (remember those? ), and had “Baton Rouge” on repeat until we had each verse memorized. Yesterday, a friend shared this story. The photo of a sweet baby girl cuddled up on her frail, head shaven, hospital gown-wearing mama was enough to make the tears start flowing. It wasn’t just the photo, she also posted this beautiful poem below, and I just couldn’t stop the tears. I’ve linked several of his posts, but this is me reading Rory’s blog; thelifeilive.com. Trust me, you’ll fall in love. This is more than a poem, more than just beautiful words. This is a song. A song by Joey + Rory. Before that tear-filled post yesterday, I had never heard of them, never listened to her pure, sweet voice, or admired their simple, farm life authenticity. It wasn’t until I read the words she penned to her husband, the words about her dying, that I became a fan. Once my kids were in bed, alone in the dark as my husband was out of town, I dove into the story of Joey and Rory. How, just shy of her daughter’s second birthday, she is preparing to die. The dreams she made with her husband, the plans to watch her baby grow… Joey is saying goodbye to that. And that makes my heart ache. As I wept, I read. Rory writes about his wife with such adoration. He prays fervently and with such honesty. It didn’t take long before I was crying that cry. The ugly one that you keep hidden until no one else is around. I cried that cry until I couldn’t anymore. Selfishly, I see my mother in the spaces of those words. Her loneliness wasn’t something she, nor my dad planned on. At least not this young, anyway. I pain for friends who trudge this road. The earth should have stopped so many times, and yet, here we are. 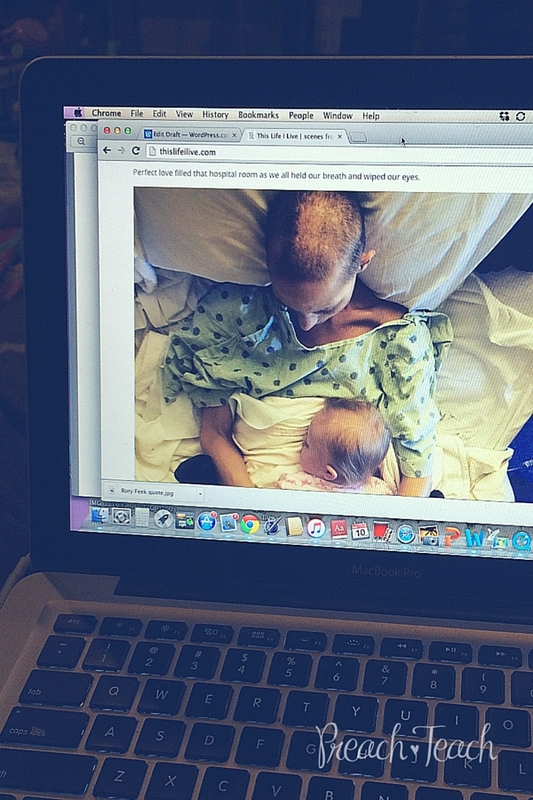 In one of the more recent videos, she sings amidst her treatments. She is so thin. Her face looks so tired. Yet this voice, effortlessly beautiful, angelic even, flows out her lips. I am so amazed by that. Even as her body is failing, she can still sing. Surely, a God given gift. Lord knows I wasn’t given a musical bone in my body. But hearing Joey sing, seeing her strapped to all those machines with her baby in the chair next to her, I mean, would I even want to sing if I were her? 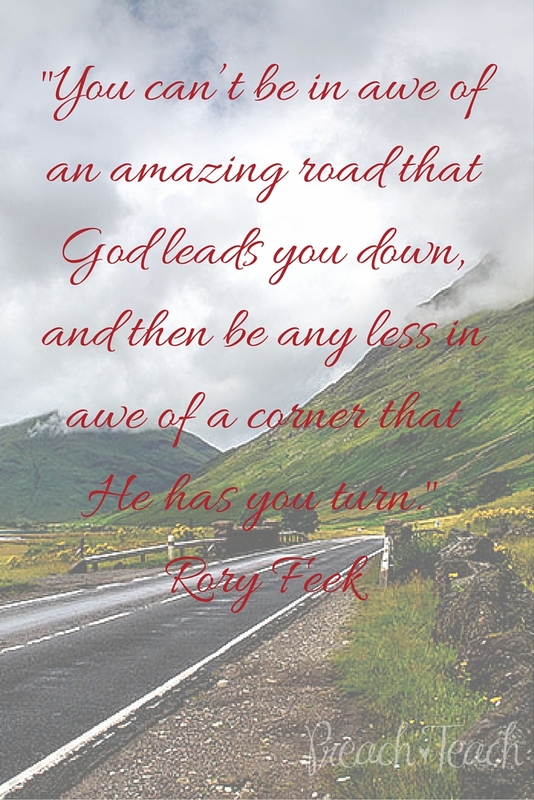 Rory wrote, “you can’t be in awe of an amazing road that God leads you down, and then be any less in awe of a corner that He has you turn.” I am certain this is not the story Joey and Rory intended on telling. I know that fear. Not as a mother or as a wife, but as a daughter. I would argue that the fear of what you leave behind is stronger than the fear of actually leaving. Whether raw or weathered, the pain of losing a loved one isn’t easily healed. If healed at all. While I am obviously a bandwagon Joey + Rory country music fan, I am so inspired by them. If we all loved our spouse the way Rory loves his wife. I mean, really. I imagine it is the kind of love God intended us to give. The faith these two freely share. To live with abandon. I admire that, and honestly I yearn to have that. I know part of me cries because I truly am heartbroken for this family. I also know a bigger part of me cries because I was reminded of what I have lost in my life. Or rather who I have lost. Yet, it makes me cry tears of gratitude as well, because I still get to be wife, and I am still here to be mama. So I better do it right. I better sing my heart out, unafraid of who is listening. We all have corners our lives have taken, and unfortunately probably more are coming. I guess, the question isn’t how can we avoid those corners, rather, it’s how will we choose to live as we make the turn? I know my words you will never read, but prayers to you Joey and Rory and your sweet family. Prayers for comfort, for peace and for sweet memories. Prayers for my friends. May we choose to trudge on together!